This recipe was suggested by another of my close University friends. I lived with Kate in my first year and throughout the year, we shared the job of resident baker. It was therefore so nice that Kate challenged me to make a cake 🙂 But this isn’t just any old cake, its one I’ve never made and have always been a bit apprehensive about making it. Why was I apprehensive – it’s a cake which has carrots and cream cheese in it! There is just something about that which never quite sat right with me. As I’ve said before, this is the whole point of Challenge 52, to take me out my comfort zone! When I started searching for recipes, I was still trying my best to avoid the cream cheese but every which way I turned, there it was. 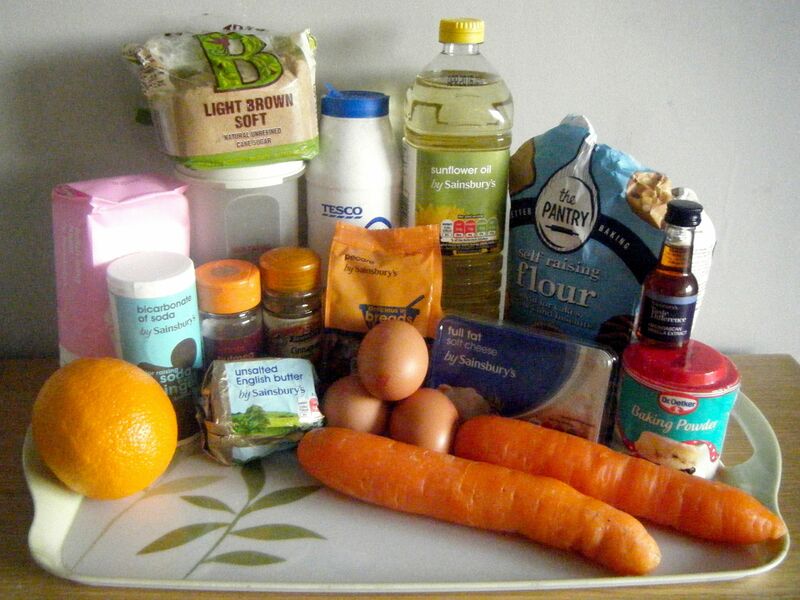 Finally, I found a recipe that didn’t use a cream cheese topping but by then I had come to realise that the cream cheese is an almost iconic part of the carrot cake and I felt guilty about leaving it out! So instead I kept looking and found this recipe by the Hairy Bikers for a carrot and sultana cake with creamy orange frosting. If you look at the ingredients photo carefully, you may note an extra ingredient which has snuck in there. I accidentally included the vanilla essence which I had purchased to stock up my store cupboard but it isn’t needed for this recipe! 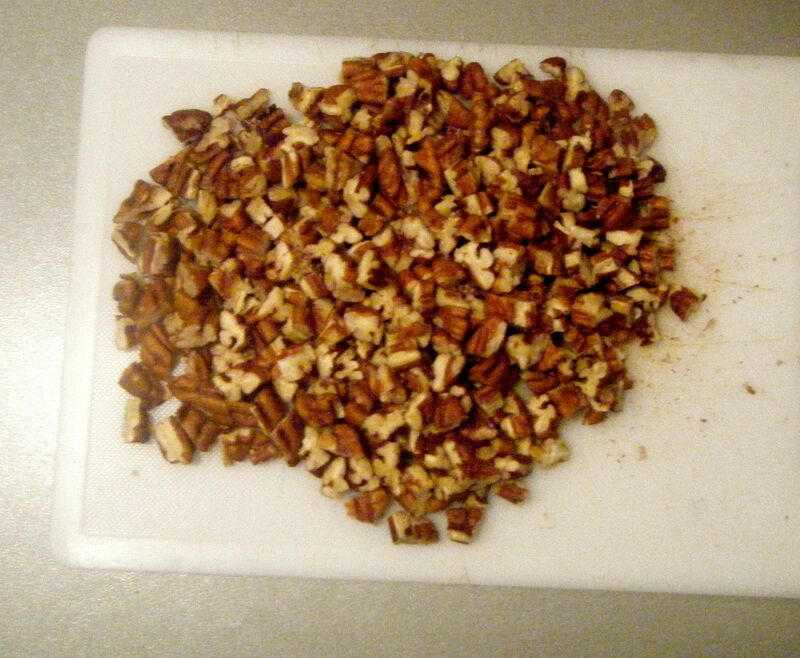 I started off by sorting through my pecans to remove all the nice whole ones to put to one side for the topping. I then weighed the remaining bits to make sure I had 75g, adding a few of the whole ones back in to bring it up to the right weight. I then chopped them up nice and small. 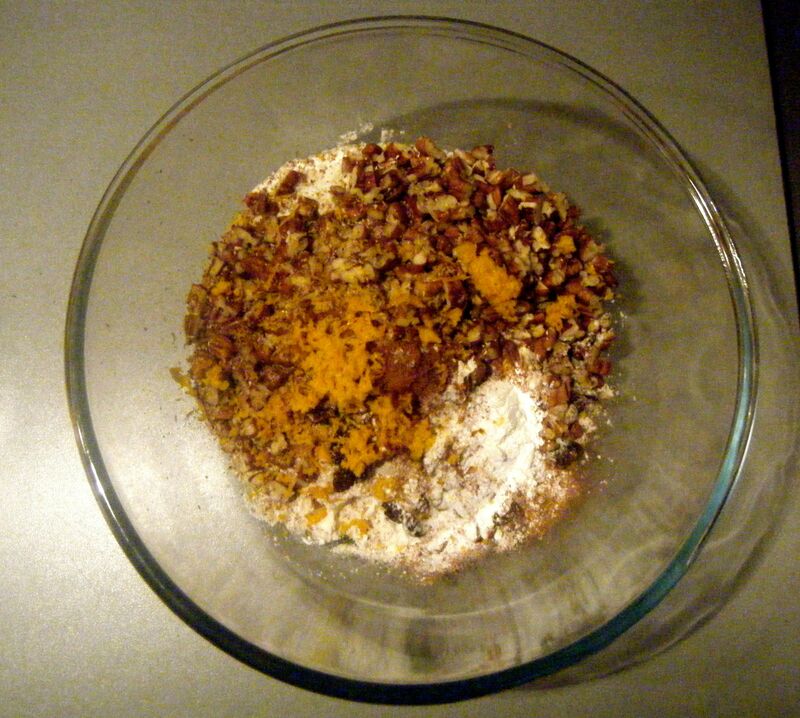 I put the nuts in a bowl with the flour, sultanas, ground cinnamon, grated nutmeg, baking power, bicarbonate of soda and the salt. I then grated in the orange zest from one half of my orange. I broke the eggs into a jug and whisked with a fork until they were smooth. 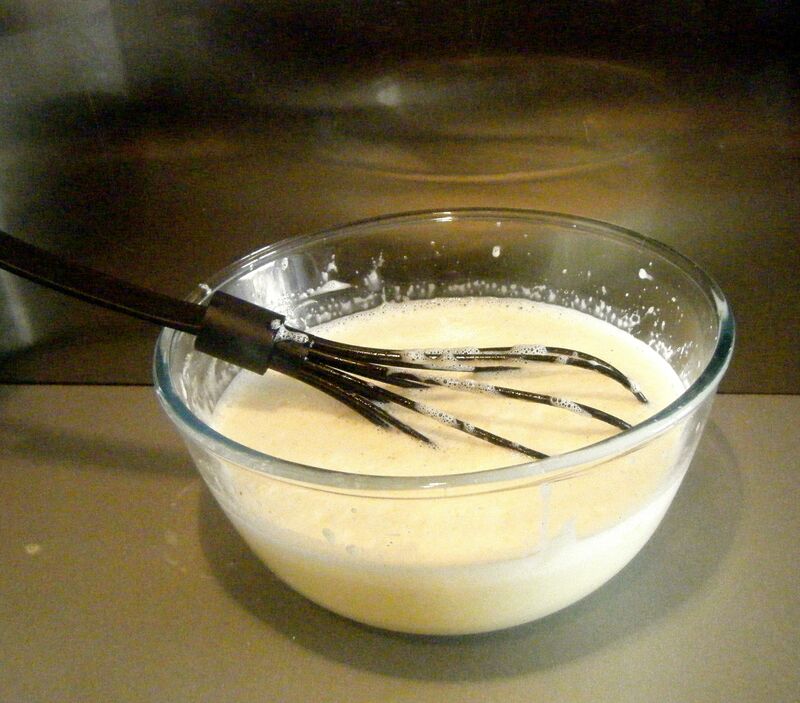 I then added the oil and brown sugar, giving it a good whisk until well combined. 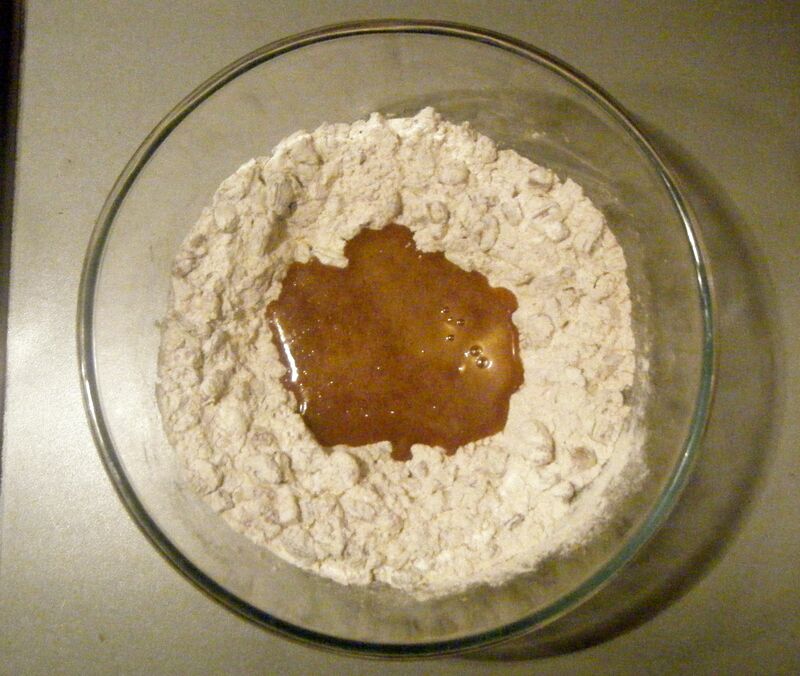 I created a well in my dry ingredients and poured in some of the egg/sugar/oil mix. 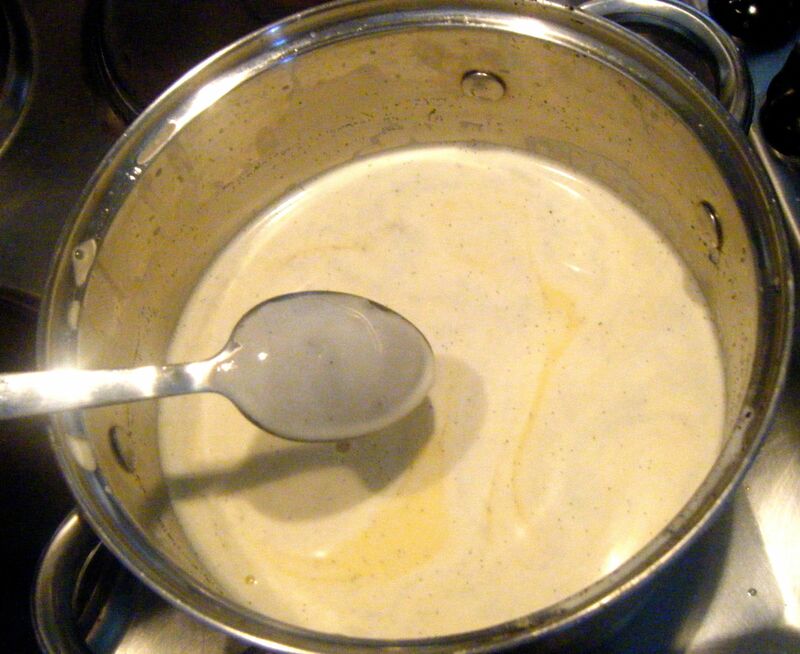 I stirred it all together with a wooden spoon, gradually adding more of the oil mix until it was all combined. 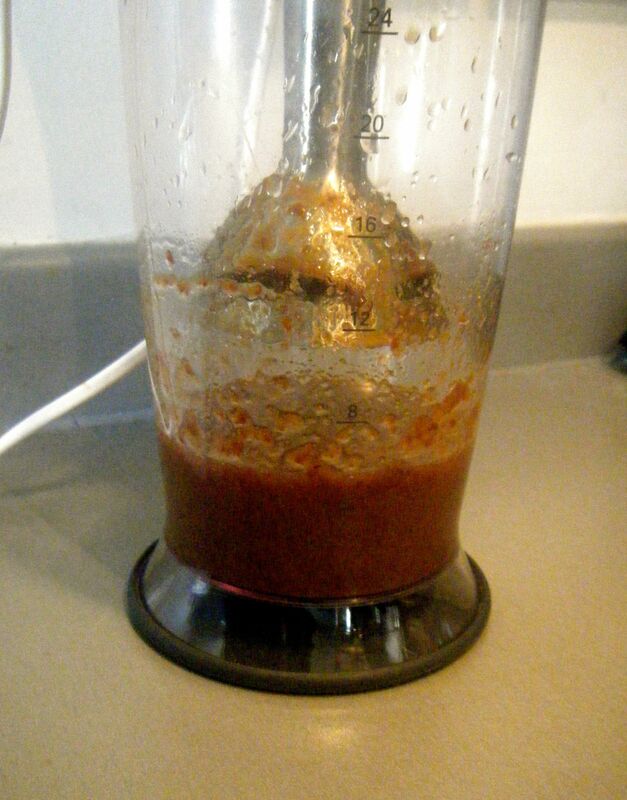 I added the grated carrot and gave it a final mix. The recipe puts the cake mix into a 20cm square cake tin but I wanted to do something a little different. I’ve found these adorable cases in the supermarket and thought it would be nice to make individual carrot cakes rather than one big one. 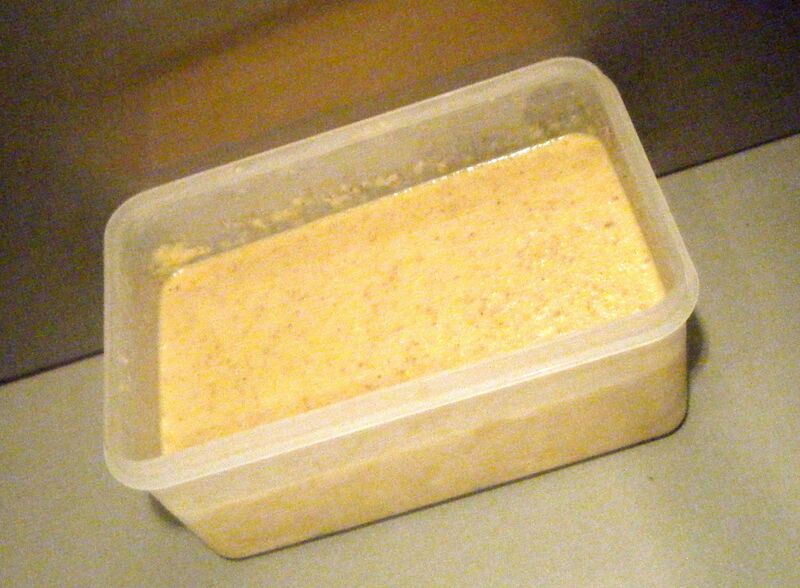 So i split the mixture between 14 cases, 13 of them weighing 79g with the mix in, and the 14th having a little less. 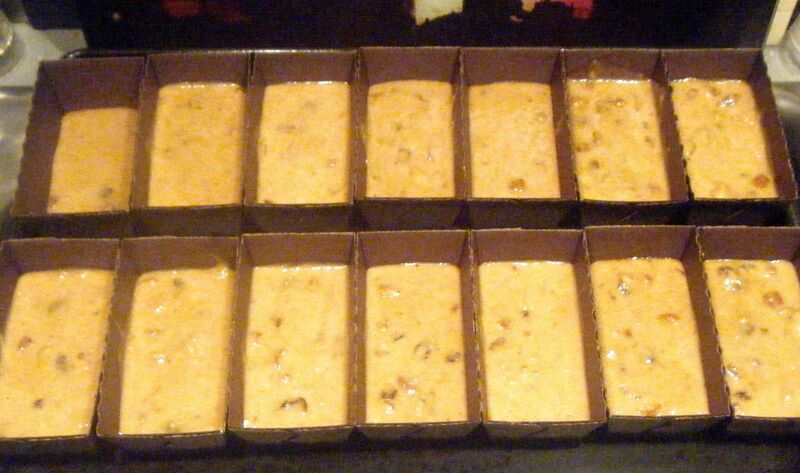 I put the filled cases on a tray and into the oven on 180 celsius. Given that I used individual cases rather than a big tin, I knew I needed to adjust the cooking time. I originally set the timer for 20 minutes and then checked them. I felt the tops of the cakes and decided they needed a little longer so I returned them to the oven for around 2-3 minutes. I then tested the cakes and decided they were done. Practical tip: I’ve given this tip a few times but it is one of the key points to perfecting your cake making skills – knowing when the cake is done. To test whether the cakes are cooked, gently press the top of one of the cakes with your finger; if it is done it will be springy to touch and bounce back into place. You can also take a tooth pick (or cake tester if you have one) and slide it into the centre of one of the cakes; if the cake is done the tester will come out clean. If you think it’s not quite done return the cakes to the oven but keep an eye on them – 1 minute may be all they need but that 1 minute can make all the difference! 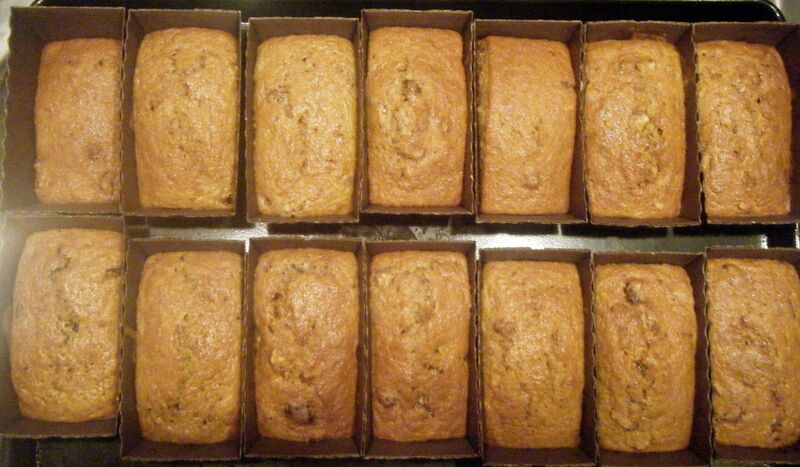 I put the cakes on a cooling rack and left them to cool completely whilst I got started on the icing. 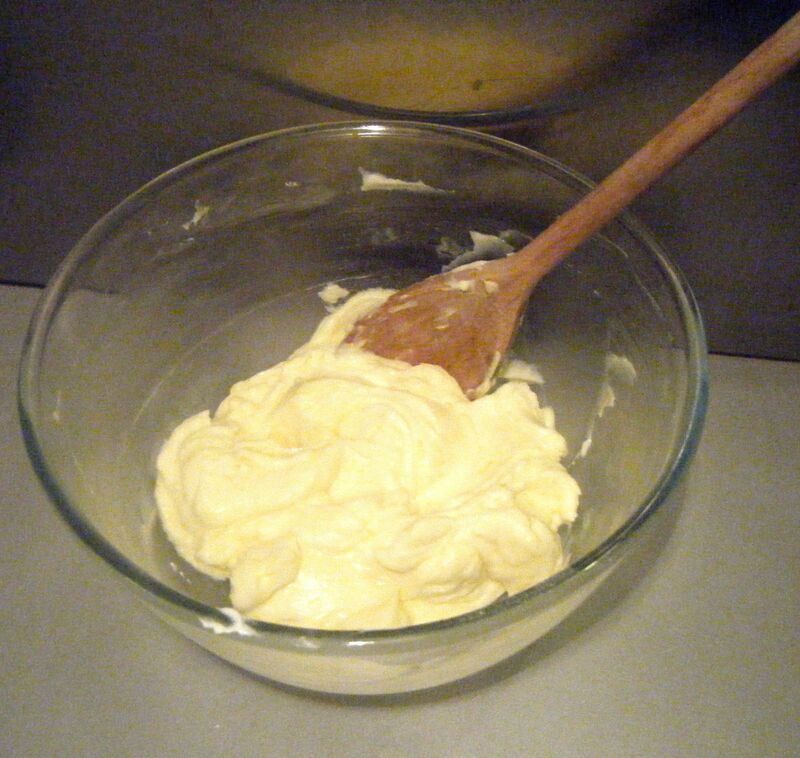 I put the softened butter in my bowl, beat it with a fork until smooth and added the orange juice. Practical tip: this is another one I’ve given before but in case you missed Challenge No. 5 I’ve included it again. To soften the butter, cut it into cubes and put it in a sandwich bag in a bowl of lukewarm water for between 5 to 10 minutes until soft. This can be a lot quicker than leaving the butter at room temperature, especially in the winter when your kitchen may not be so warm! I then gradually sifted in the icing sugar a bit at a time, giving it a good stir between each addition. 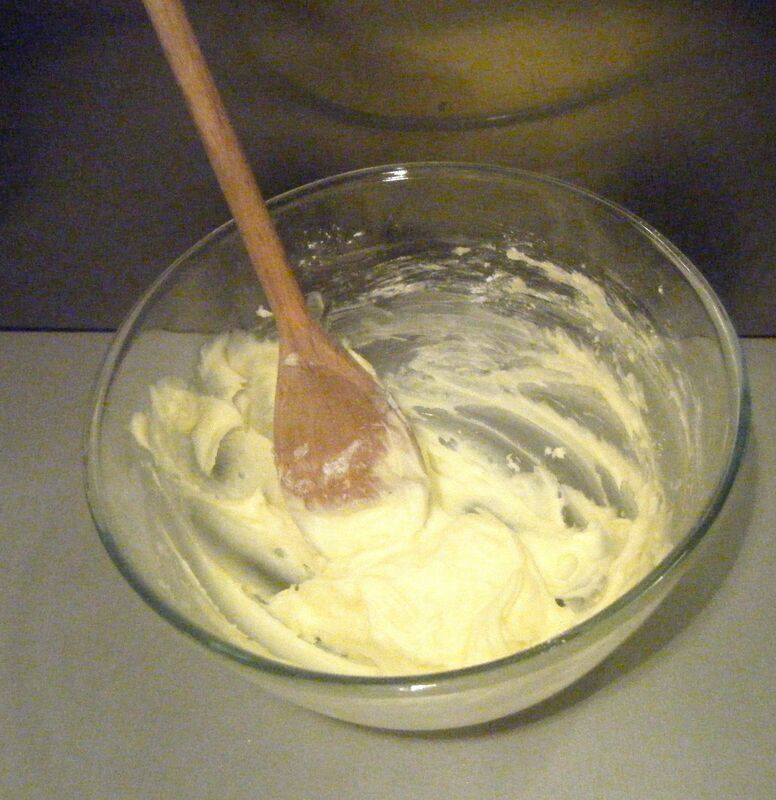 Once it was all added, I used a wooden spoon to beat until light and creamy. 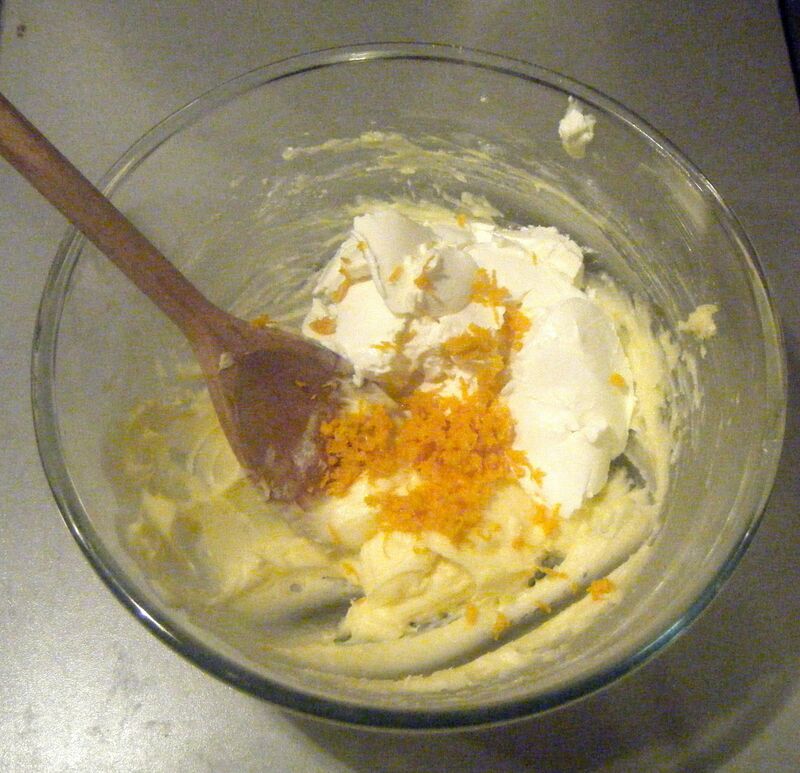 I stirred through the cream cheese and remaining orange zest before popping it in the fridge for 30 minutes. When the icing was firm, I used a teaspoon to smooth a bit on each cake. Finally, it was time to add the decoration. The recipe uses the whole pecans (which I set aside at the beginning) but I wanted to do something a little bit cuter. 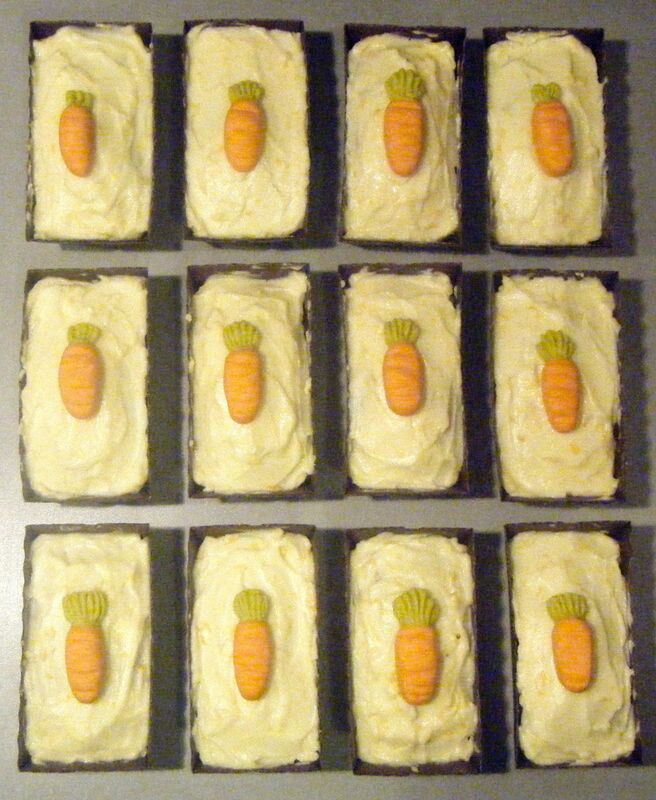 So I made mini icing carrots with some coloured fondant icing and added one to each cake. 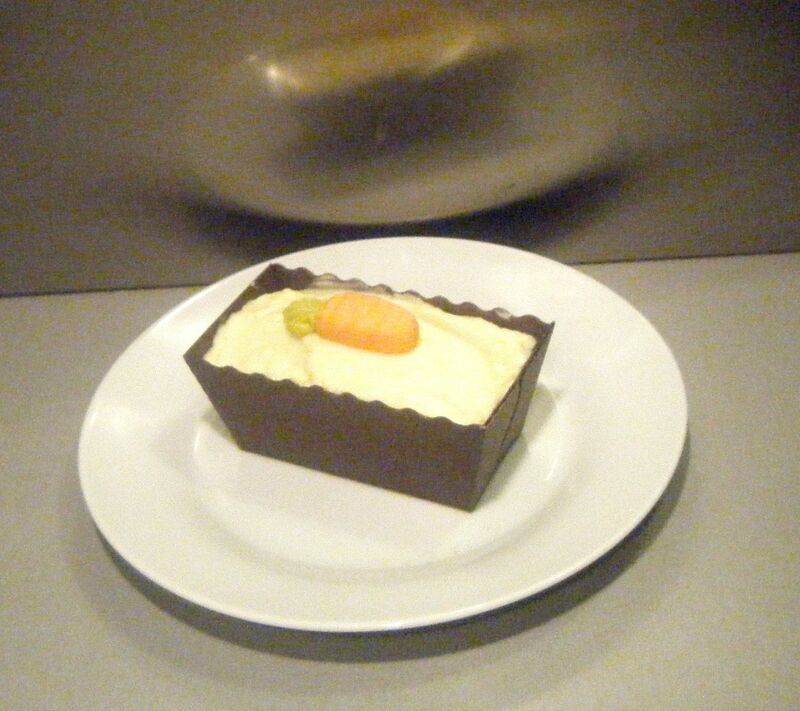 I even managed to persuade Dave to try this one (he had an issue with the whole carrot in a cake thing!) and he said “actually, its quite nice”. I feel this is a great review, all things considering. Personally, I really enjoyed this challenge, both eating and making the cakes. They weren’t too heavy and were just perfect with a cup of tea. Coming up next week, Challenge No. 22 – homemade burgers. 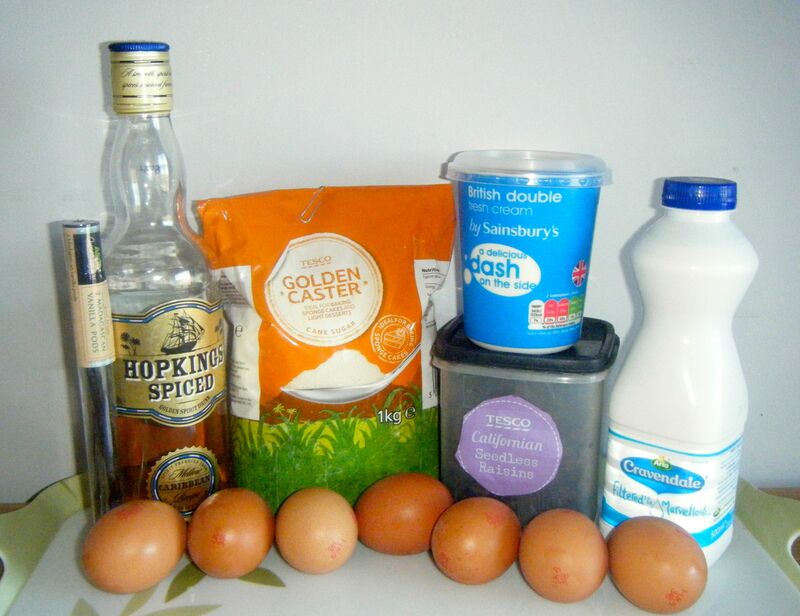 Although I had found a recipe for vanilla ice cream, I kept having a sneaky look online and do you know what I found? One of my new blogging friends has blogged about the same recipe. You can see read about Laura’s experience at Feast Wisely. Jamie’s book (Jamie’s Comfort Food) not only gives you a lovely recipe for vanilla ice cream, it also gives 4 delicious flavour variations. One of my mum’s favourites is rum and raisin ice cream – she say’s its her ‘holiday ice cream’ but I think she would have it all the time if she could 😉 I know I would! Anyway, on with the recipe. 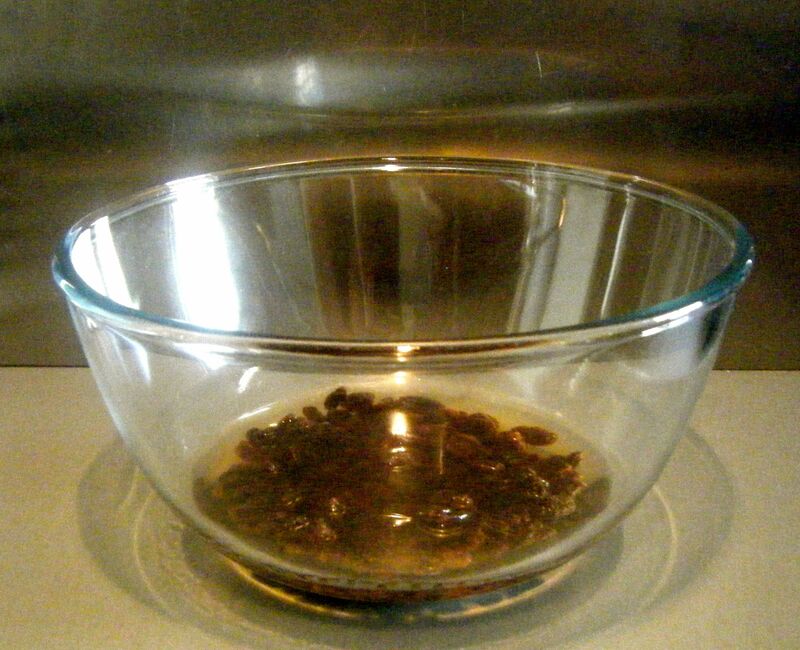 I started off by putting the raisins in a bowl and covering them with the spiced rum. 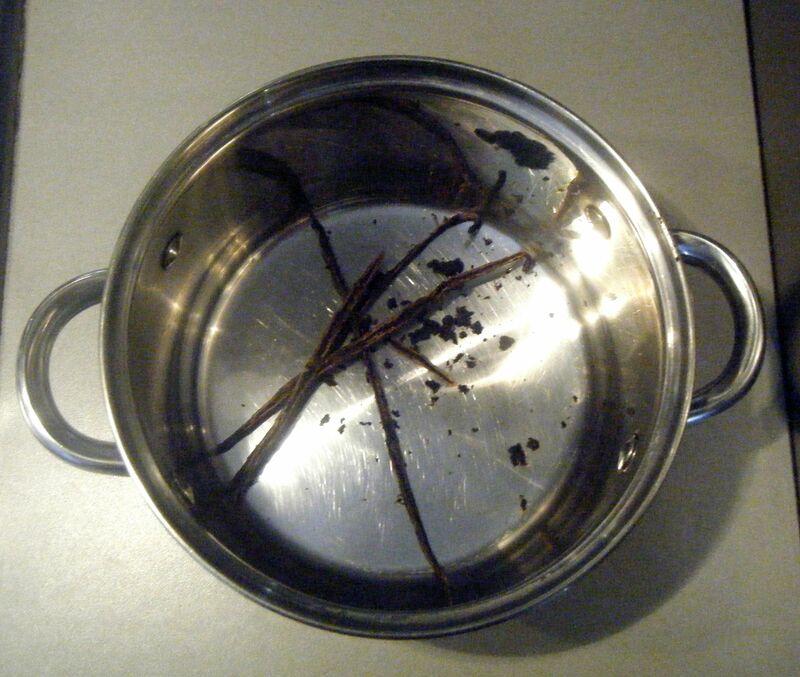 I covered the bowl with cling film and left it on the side for around a couple of hours. 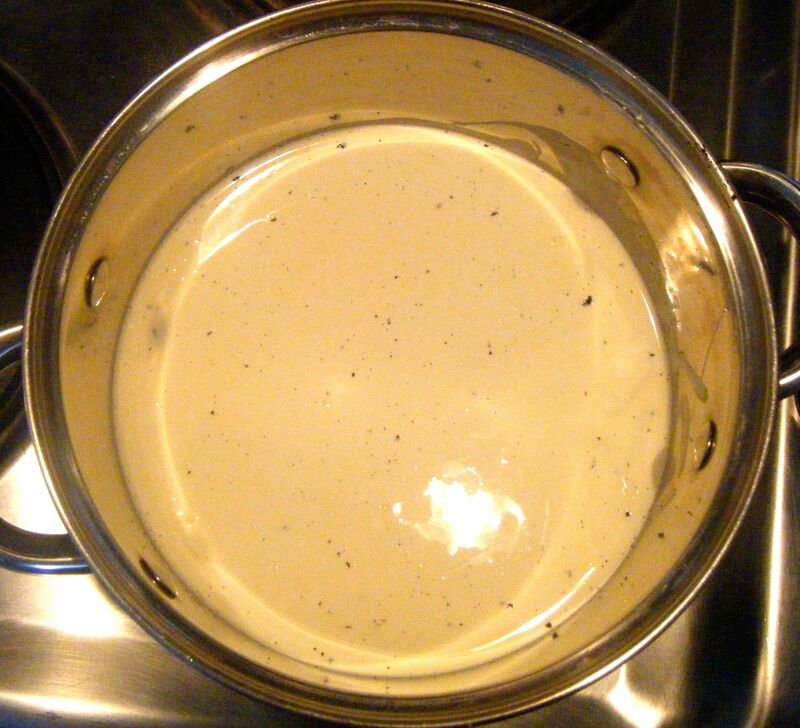 Once I had about half hour left, I got on with making the vanilla ice cream. I halved the vanilla pods lengthways and scraped out the seeds. I’ve seen chef’s do this on TV and it looks really simple…it wasn’t! I got in a bit of a mess but I managed to scrape most of the seeds out and get them in the pan. I added the pods to the seeds and poured over the milk and cream. I put the pan on a low heat to gently warm for 15 minutes and then took it off the heat. 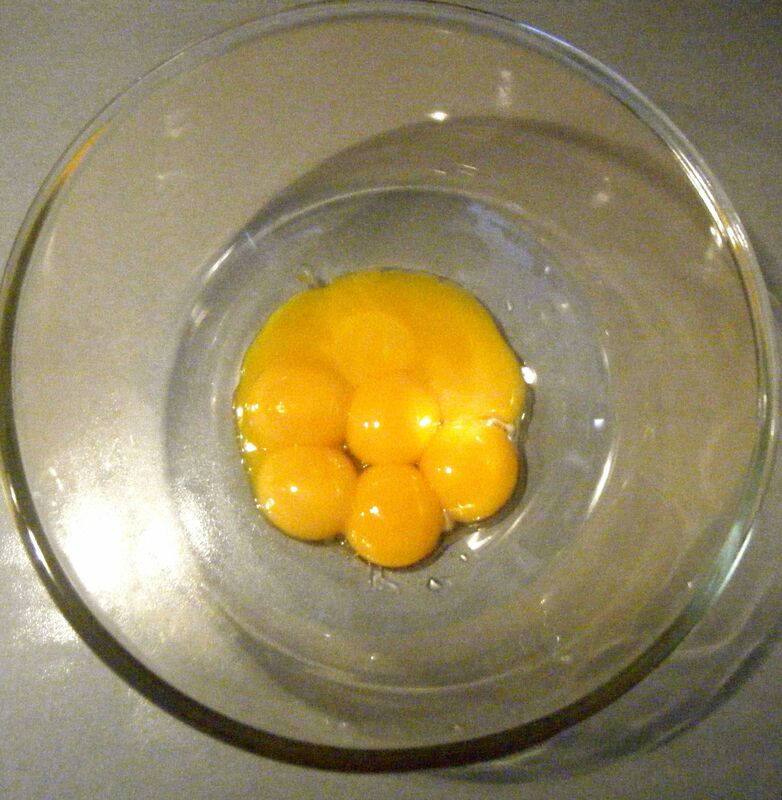 Whilst the vanilla cream mixture was cooling slightly, I separated my eggs and put the yolks in a bowl. Practical tip: Jamie advises to freeze the egg whites in a sandwich bag to make meringues for another day. I therefore dutifully put the whites in a plastic container and put in the fridge so I could later make room for it in the freezer – I then promptly forgot to do this and ended up throwing away the whites! Silly me! 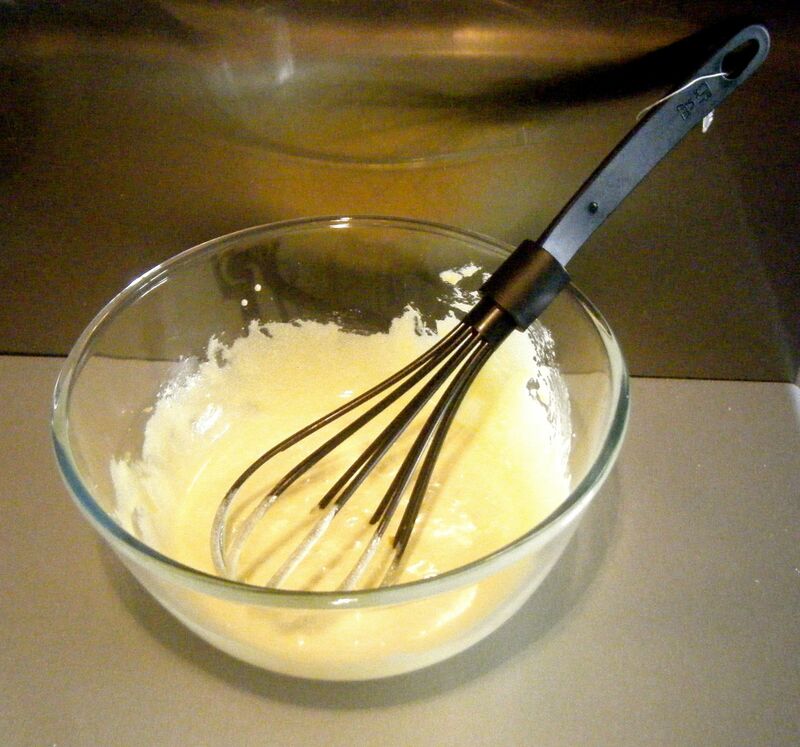 I whisked the yolks and caster sugar with a balloon whisk until pale. 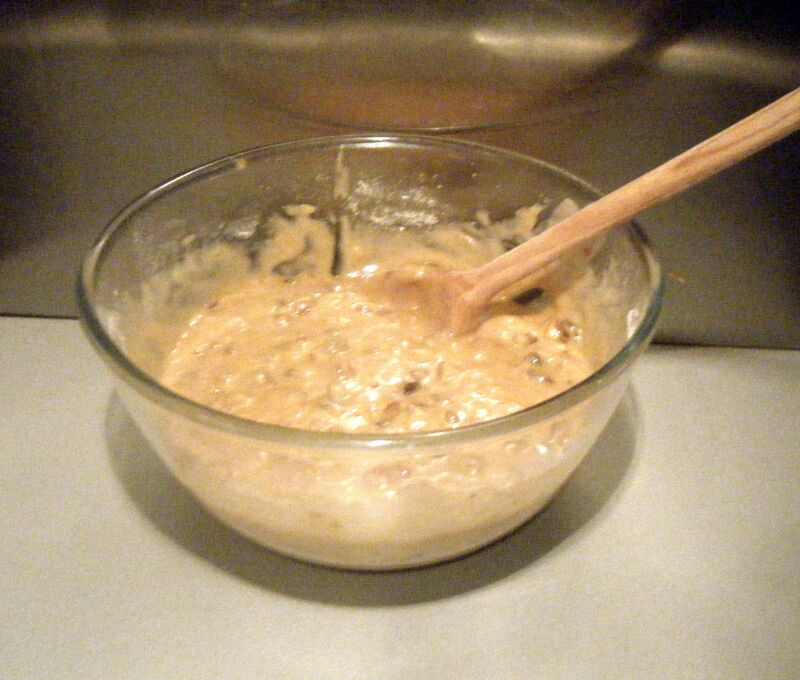 Before combining the vanilla milk with the egg/sugar mix, I sorted out the soaked raisins. I took out around half and put them to one side. I then used a hand blender to blitz the remaining raisins and rum together until it was a smooth purée. 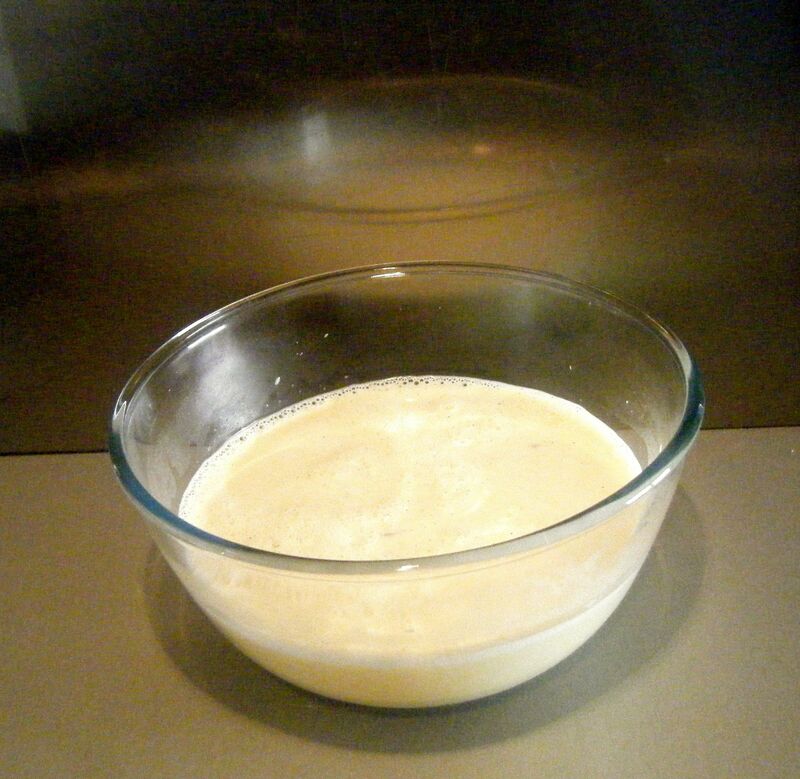 I then took the vanilla cream mixture and poured it through a sieve into my egg/sugar mix. I added a bit at a time and whisked thoroughly between each addition. At the end, I made sure to push through as many vanilla seeds as possible – I mean come on, the more true vanilla flavour you can get the better! I added the combined mixture back into my pan and put it over a very low heat. I stirred constantly, patiently waiting for the mixture to thicken. Jamie’s says this should take about 15 minutes but it took me longer. I had my pan on a very low heat and perhaps I could have turned it up slightly but I didn’t want to burn it. When it was finally thick enough to coat the back of a spoon, I was happy it was done. 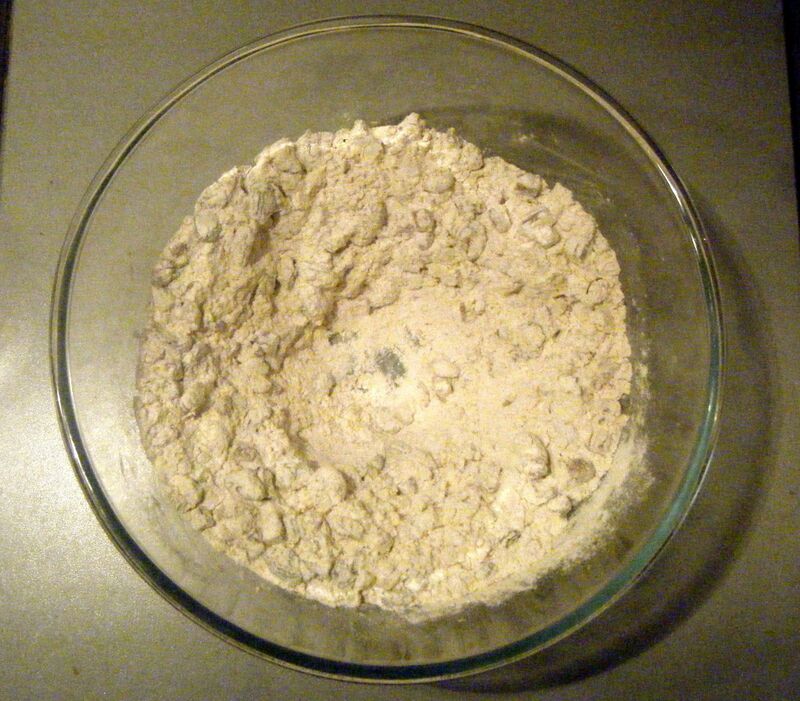 I poured the mixture in to a clean bowl and left it to cool – this took about a couple of hours. Time to add the rum/raisin to my vanilla ice cream. I poured in the purée and whole raisins into the cooled ice cream base and gave it a good stir. 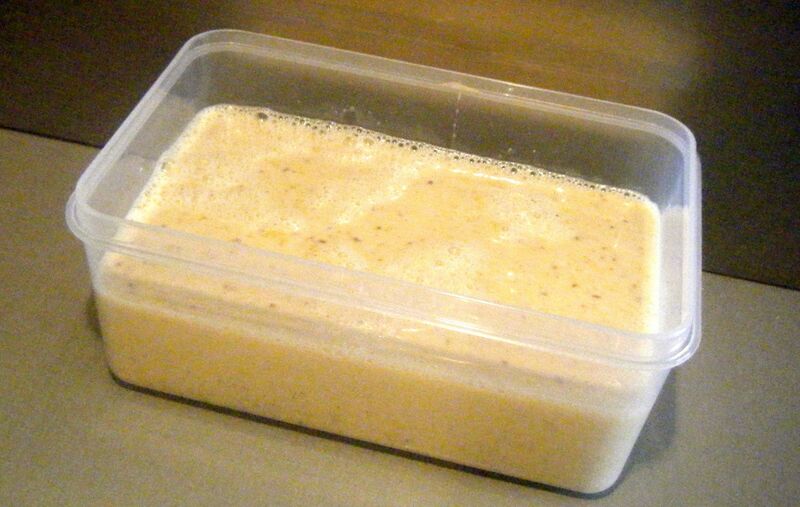 I then poured it all into my ice cream contained (a simple klick lock storage box). I put the container into my freezer and set the time for 30 minutes. According to the recipe you need to whisk the ice cream every 30 minutes for about 3 to 4 hours to help break up the ice crystals. The aim is to do this until the ice cream is nicely set. When I read Laura’s blog, she mentioned that she stopped stirring too soon and ended up with some ice crystals. I therefore tried to preserver and when I had reached 4 hours and it still was set, I just kept going with my 30 minutes schedule. I got to 5 and a half hours and it still wasn’t set! It was also time for bed so I just left it for the night and hoped it would be okay in the morning. Now, I don’t know about you but if I am going to have ice cream, it clearly has to be served with either hot chocolate fudge cake, a cone or perhaps best of all, cookies! 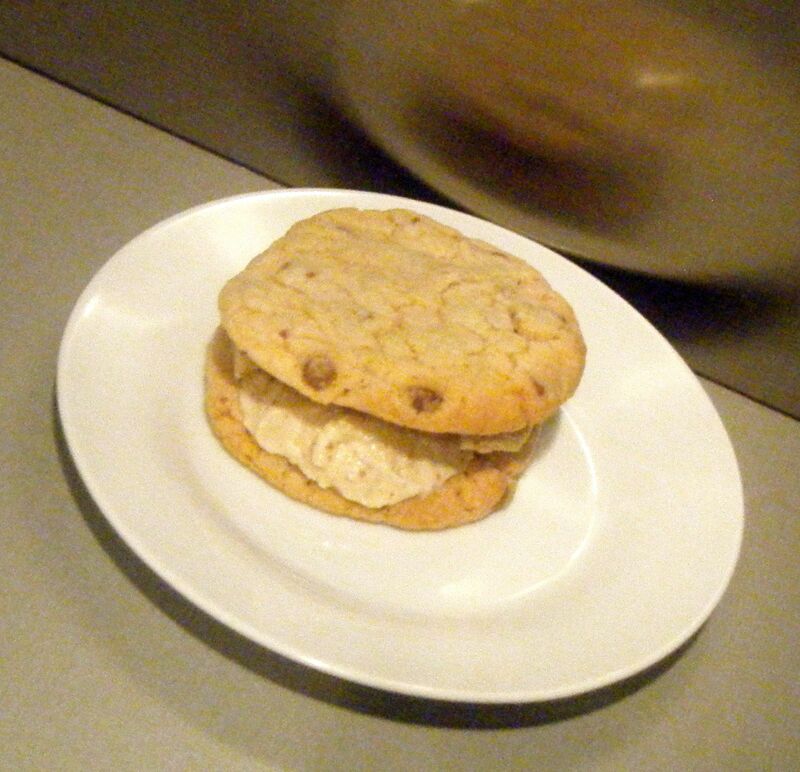 So I also made some chocolate chip cookies to sandwich together with the ice cream. Be sure to come back after the end of Challenge 52 when I will be sharing my foolproof recipe for these delicious cookies. This was absolutely delicious! Dave tried a TINY bit and said “whoaa, you can taste the rum in that!”. Well that’s what we want – rum, raisin and vanilla galore. I’ve now got to be controlled and make sure I don’t eat the whole lot before my mum next comes to visit! Coming up next week, Challenge No. 20 – maple syrup glazed ham! Hope to see you then.